Nintendo of Europe is preparing to bombard the Wii and 3DS Virtual Console services with games next month. Here's the full line-up of what's expected to reach Europe in March. Super Street Fighter II (Mega Drive) — The first Virtual Console title in Europe to receive online multiplayer. Strider (Mega Drive) — Strider Hiryu's fantastic 16-bit translation hit North America recently, and should get to Europe in March. Samurai Shodown IV: Amakusa's Revenge (Neo Geo) — Another Neo Geo title after the surprising release of King of Fighters '97 at the start of February. 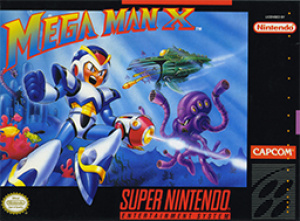 Mega Man X (SNES) — More adventures from the Blue Bomber at long last. Dr. Mario (Game Boy) — Pills and viruses once again with the good doctor. Kid Icarus: Of Myths and Monsters (Game Boy) — To nobody's surprise, Nintendo is preparing this GB-only title ahead of the launch of Kid Icarus: Uprising. Super Mario Bros. (NES) — No introduction necessary, surely. Metroid (NES) — Samus Aran's first-ever adventure is coming to 3DS in March too. Dragon Crystal (Game Gear) — An intriguing roguelike, if not a bona fide classic. Shinobi (Game Gear) — More Musashi action on the go. Sonic the Hedgehog Triple Trouble (Game Gear) — The first appearance of Nack/Fang the Weasel, fact fans. Not a bad line-up of Virtual Console games, all in all. What do you make of it? 29th February 2012 – This March is set to be the biggest month ever for Virtual Console as Nintendo announces a bumper crop of classic games set to launch via the Nintendo eShop and Wii Shop Channel. Nintendo 3DS owners can look forward to replaying classic NES, Game Boy and for the first time ever SEGA Game Gear titles from some of the platform’s most famous franchises. Meanwhile Wii owners can download games from three different classic consoles including some of Capcom and SEGA’s finest throughout the month. The month of March heralds a wide range of interesting games to download including a chance to replay where it all began for Samus Aran when the original Metroid from the NES becomes available to download on your Nintendo 3DS. Those of you who are looking forward to the upcoming release of Kid Icarus™: Uprising can download the Game Boy title, Kid Icarus™ Of Myths and Monsters allowing Nintendo 3DS owners to become better acquainted with the angelic angel Pit and his action-packed adventures! Dust off your stethoscope and get ready for some pill arranging action with the classic Game Boy puzzler Dr Mario™, finally arriving to the Nintendo eShop. March will also see the long awaited arrival of the classic SEGA Game Gear line-up including Dragon Crystal™, Shinobi™ and Sonic the Hedgehog™: Triple Trouble. Wii owners are in for a treat this month when Mega Man X and Mega Man 5 become available on Wii Virtual Console and Super Street Fighter 2 is the first Virtual Console title with Nintendo Wi-Fi Connection functionality which allows fans of the legendary fighting franchise to challenge each other online. You will be treated to even more of history’s best 2D fighting and sidescrolling action in Strider and Samurai Shodown IV: Amakusa’s Revenge respectively. The month of Virtual Console will kick off this week with two NES classics in the form of the original Super Mario Bros.™ and Punch-Out! !™, both available via the Nintendo eShop. Mario and Luigi have been rescuing princesses and battling Bowser for over 25 years and you now have the chance to play the ultimate classic on your Nintendo 3DS. @James: I think Metroid should be added to the list. It's mentioned in the second paragraph of the press release. Great cult third party list for the Wii and the GG games don't sound bad either. Especially nice to see them, the Mega Man games and Kid Icarus. The only negative in my book is the release of the GB version of Dr. Mario since it won't support mulitplayer unless hell freezes over. Hope everybody knows what he's getting there and that Nintendo could at least have released the NES version where it should work. Yes! I love the Megadrive version of Super Street Fighter 2. The speech is a bit rough but the music and sound effects are pretty much spot on. Can't wait to try the online. So this week we will see Mario Bros and Punch Out in the Nintendo Download ? Why not give us the Kid Icarus gameboy game And i hope they release Mario bros 2 soon !! wow, that is actually a pretty decent line up.would be nice to get a line up like this every month. Where in the press release does it say it's the Mega Drive version of SSFII? The Official Nintendo Magazine pits it as an update to the already released SNES version. @Spocker Not mentioned in this press release but was confirmed in November Capcom also tells me SEGA is publishing the game in the West so it must be the MD version. What is taking Mega Man X2 so long to hit the NA....Does Capcom enjoy torturing us? Wow, 13 VC games in one month. Now I don't want to hear anyone from EU complaining about "why is this game not on the list" blah blah blah. Seriously, thats a good deal right there. Out of those, I plan on getting Punch-out, Kid Icarus: Of myths and monsters and maybe Sonic: triple trouble. Getting Mega Man X and Mega Man 5. Does Capcom enjoy torturing us? Give Capcom a break. You just got Strider. They're the only one who showed love to NA Virtual Console since August 2011. You know Japan will get Rockman X2 first. Its not coming. Its Austalia's exclusive game in PAL regions. Europe got something different. Change your region to Australia and get it that way. Only one I'll be getting will be Shinobi. I've either got the other games on other formats or I have no interest in them.Still this is a great line up and its nice to see Wii VC getting some love.Also Online multiplayer for Street Fighter is great.Wish they could have implemented this with other games a bit sooner though. SNES /N64 MarioKart with online would have been awesome.Seems a strange time to do it now the Wii is on its last legs but whatever. Oldboy I don't understand the many versions of Street Fighter at all, but NoE is just playing catch-up with the VC with stuff that already came out elsewhere. Its kinda cool they're doing it in bulk. @Heavy_Barrel There hasn't even been a Metal Slug release on the Japan VC since Metal Slug 2 was put on in 2008. You might be in for a wait. This says to me that the VC/ wiiware library of content will transition pretty directly to the WiiU and hopefully there'll also be a good migration system, I'll be seriously pissed if all this new stuff needs to be re-purchased for WiiU. Good to see these classics are still getting love as long as it stays with us for the new System. Hmm, interesting. That could mean Japan gets it in April too, which is good for me. Where's The Legend of Zelda? I hope Reggie is taking notes if any of these games that are yet to be released in the US region will be available to download. They are behind in the number of 3DS VC games compared to the PAL region right now. Nintendo needs to find a way to get 8 Wii VC games added to reach the 400 plateau. aw come on! you mean not at least one person is going to say "bah, nothing for me this week" theres got to be at least one person not satisfied with this update or this just wouldnt be right. There is. Read closer, at least a few people were like "Where's _____ "? After this huge update they're still wanting more. @ fear30000 And speaking of, NA hasn't gotten this yet either. And if you still want a game that's already available on like, a dozen other platforms, maybe next month 'kay? Did I just read that, or dream it? Congrats, my European friends! Now, watch us North Americans get squat in March, hee hee (of course, Reggie did announce The Last Story for us, I'll wait and see). congrats, Europe. Enjoy it while you can. @Fluttershyguy I know that NoA and NoE are fairly separate entities, but I can't imagine this huge game of catch-up would go unmatched in NA. What is the VC missing in the States and Canada? Prince of Persia, King of Fighters '97, Adventure Island II, and a bunch of sports and action games that I've never heard of. I wouldn't be surprised if NA got a catch-up batch soon. It could go either way, but its nice that EU is getting all the big releases they've been waiting for in one month. but I have no qualms about owning it on another system. @James But when is Street Fighter II with online coming out here in NA? Surely it will be in March also? Ah, Megaman x, Megaman 5 and the Kid icarus gameboy game are coming! Good news! !